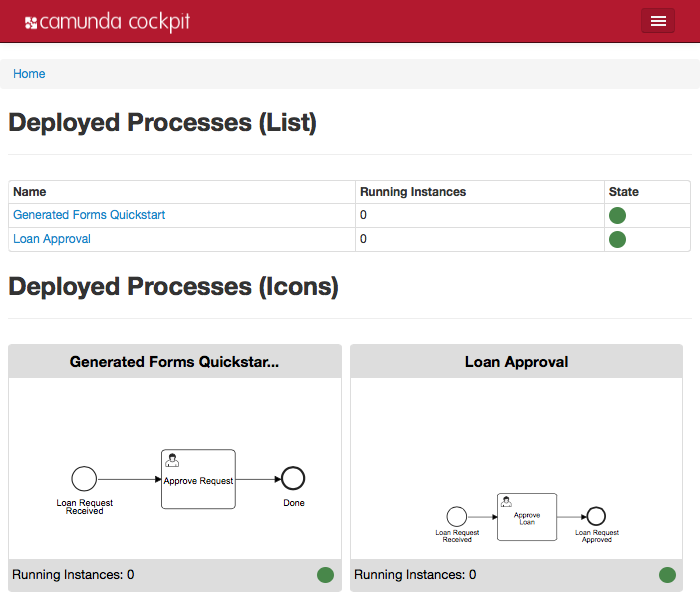 The camunda documentation includes a tutorial for developing process applications that shows how to install camunda BPM, build and deploy a simple process, and interact with the process using camunda’s Cockpit and Tasklist web applications. The tutorial uses the camunda BPM platform distribution that includes Apache Tomcat 7, runs on a local file-based H2 database, and shows a Java Servlet-based process application. Let’s consider an alternative architecture. For this version of the tutorial, we are going to use a standalone distribution of the camunda web applications, embed the camunda BPM process engine in a Play/Scala web application, and use a shared PostgreSQL database for the two. This version of the tutorial has more configuration steps than the camunda version, but the end result is easier to understand if you are familiar with Play framework applications because nothing happens automatically. There are other Java versions, Java Servlet containers and SQL databases that work; see Camunda’s supported environments for details. First, install and start PostgreSQL (e.g. using Homebrew with brew install postgres on OS X). Open the PostgreSQL command line with (psql template1) and use the following commands to create a user and database. On the camunda download page, download the camunda Standalone Webapp for Apache Tomcat 7. Using your own Apache Tomcat installation location, deploy the WAR file - ‘exploded’ so we can edit the database configuration. Add the PostgreSQL JDBC driver to the camunda web application. If you don’t already have it, you can download the JAR from the corresponding http://mvnrepository.com artifact page or proceed with the next section until the Play application has downloaded the dependency to the local Ivy cache. 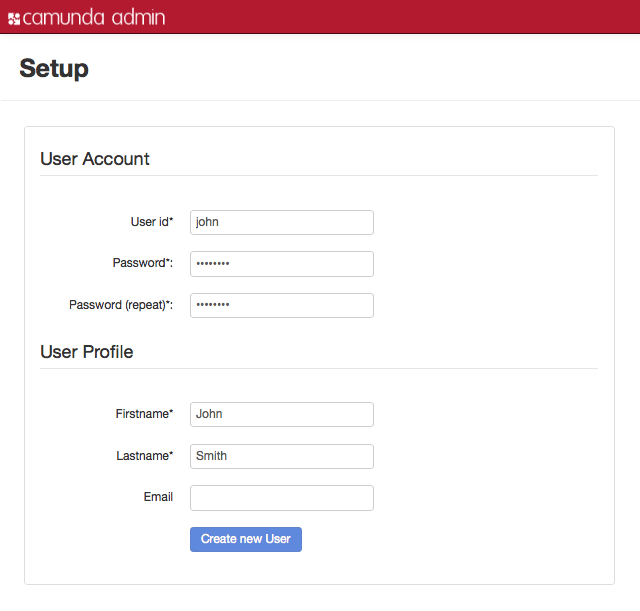 Open the camunda web application at http://localhost:8080/camunda/ and create a new admin user with user name admin. Now you are ready to build your own process application and deploy a business process to the database. The next steps are to create a new Play framework application, add a BPMN process definition and run the application to deploy the process definition to the database, so we can see it in the camunda BPM Cockpit application. First, download Play framework 2.3 from the Play framework download page. The default approach is to download Activator and use that to create a new Play application; alternatively, you can add Play as a dependency to a new sbt project. Download loan-approval.bpmn from Step 3 of the Developing Process Applications tutorial code and add it to your application in conf/loan-approval.bpmn so it will be available on the application’s runtime classpath. Next we need some code that will use the camunda BPM API to deploy loan-approval.bpmn to the process engine database. Add the following code in the new file app/Global.scala, to start the process engine and deploy the BPMN file when the Play application starts-up. * Start the camunda BPM process engine and deploy process definitions on start-up. This code uses the camunda BPM API to configure the process engine programmatically. In a real application, you would externalise this to a configuration like the following in conf/application.conf and use the Play configuration API instead of hard-coding the values. Anyway, for now, we have everything we need to run the Play application and deploy the business process. Now we are ready to use our new Play application to deploy our business process. First log in to Cockpit as the user that you created in the first section, above. The Cockpit dashboard shows Deployed Processes, which at this stage is only the sample Generated Forms Quickstart that the web application initially installs. Now, in the Play application directory, start the Play application to deploy the loan approval process. The two lines starting [info] application are the application log output from our Global.onStart code. Note that if starting the process engine fails with ProcessEngineException: historyLevel mismatch then you need to use a different history level in the call to setHistory in Global.onStart, such as HISTORY_FULL. The other values are listed in the configuration properties reference. At this stage, we have deployed a process definition which means that we have defined a workflow that we can now execute in the process engine. We have described the process for approving a loan, but we don’t have any actual approvals to do yet. We need to be able to start a process instance based on this process definition. On the Start a process dialog, select the Loan Approval process, then click Start. 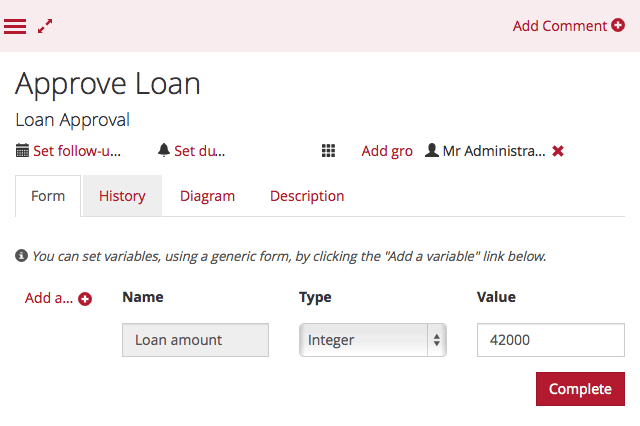 Now select the new filter in the first column, and the Approve Loan task will be listed in the second column. Although the camunda Tasklist will be enough in some cases, you might want to integrate process instances with your application. You can either use the camunda REST API or the Java API. To be able to start process instances from our application, we will add a simple HTTP endpoint. Initially, this is like a simplified version of the camunda REST API, but demonstrates how to use the Java API. $ curl --include --request POST "http://localhost:9000/loan-approval/42000"
However, it is not possible to run this from the camunda Tasklist, as in the original tutorial, because our architecture is different. Our application is using a separate process engine to Tasklist, which therefore does not have access to the ProcessRequestDelegate. Instead, it is necessary to control the process from within our own application, using the camunda Java API. This is, of course, left as an exercise for the reader.